The Chinese have launched the Shi Jian 11-03 satellite via their Long March 2C (Chang Zheng-2C) launch vehicle. The launch was listed at 04:28 UTC on Wednesday, lifting off from the SLS-2 launch pad at the Jiuquan Satellite Launch Center. Assuming the same flight profile as the Shi Jian 11-01 – launched on November 12, 2009 – the new satellite will have separated from the upper stage 12 minutes after launch. The satellite was developed by the DongFangHong Satellite Company of the China Aerospace Science and Technology Corp.
As with Shi Jian 11-01, the true mission of Shi Jian 11-03 was not revealed. At the time of the Shi Jian 11-01 launch, some observers noted that its orbit was very similar to the orbit of Shiyan-2, which was launched in November 2002, meaning Shi Jian 11-01 may have been the first operational early warning satellite. ‘Shi Jian’ means ‘Practice’ and this series of satellites have been used with a variety of configurations and missions for scientific research and technological experiments. The CZ-2C Chang Zheng – a low Earth orbit launch vehicle derived from DF-5 ICBM – can be launched from either the Jiuquan Satellite Launch Center or the Taiyuan Satellite Launch Center. The rocket is a two stage hypergolic launch vehicle with a total length of 35.15 meters, a diameter of 3.35 meters and a total mass of 192,000 kg. The first stage is equipped with four YF-20A engines. It has a length of 20.52 meters and a burn time of 122 seconds. The second stage is equipped with one YF-22A engine, and has a length of 7.50 meters with a burn time of 130 seconds. This launch was the 140th Chinese orbital launch, the 139th launch of the Chang Zheng launch vehicle family. It was also the 47th orbital launch from the Jiuquan Satellite launch Center, and the third orbital launch from China this year. Also known as the Shuang Cheng Tze launch center, the Jiuquan Satellite Launch Center was the first Chinese satellite launch center. This launch comes when the Chinese schedule for 2011 enters a fast pace of launches. Late in 2010, some Chinese specialists noted the country was preparing to make 20 orbital launches in 2011. However, now it looks like this number of missions was realigned, with some launch being delayed to 2012. 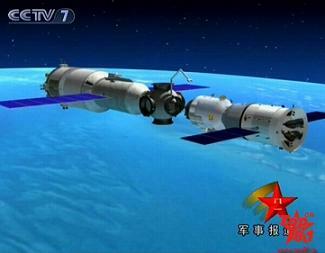 2011 is an important year for the Chinese space program, as the country prepares to attempt the first docking in orbit. The TG-1 TianGong-1 space module was delivered to Jiuquan on June 29th after all the major testing was completed, allowing it to enter the final preparations for launch – currently scheduled for late September or early October. After the launch and orbital checkout of TianGong-1, China will launch the unmanned SZ-8 Shenzhou-8 to dock with the orbital module. This is an important step for the establishment of a manned orbital laboratory, and a successful mission will pave the way for the launch of the manned Shenzhou-9 and Shenzhou-10 in 2012. Also this year China plans to affirm its position on the international launch market with three commercial launches. On August 14th, Pakistan Independence Day, China plans to launch the PakSat-1R communications satellite, followed in September with another CZ-3B/E Chang Zheng-3B/E mission to launch the Eutelsat-W3C satellite for the European operator Eutelsat. Later in December is the planned launch of the NigComSat-2 (NigComSat-1R) for Nigeria. All of these launches will take place from the Xi Chang satellite Launch Center. December will also see China launch the Turkish Gokturk-2 observation satellite, while other planned missions include the TL-1B Tian Lian-1B tracking and data relay satellite in July, the launch of the first HY-2 Hai Yang-2 oceanographic satellite series, the launch of at least three BeiDou-2 ‘Compass’ navigation satellites and the launch military observation ZY-1 Zi Yuan-1 (2C) satellite.